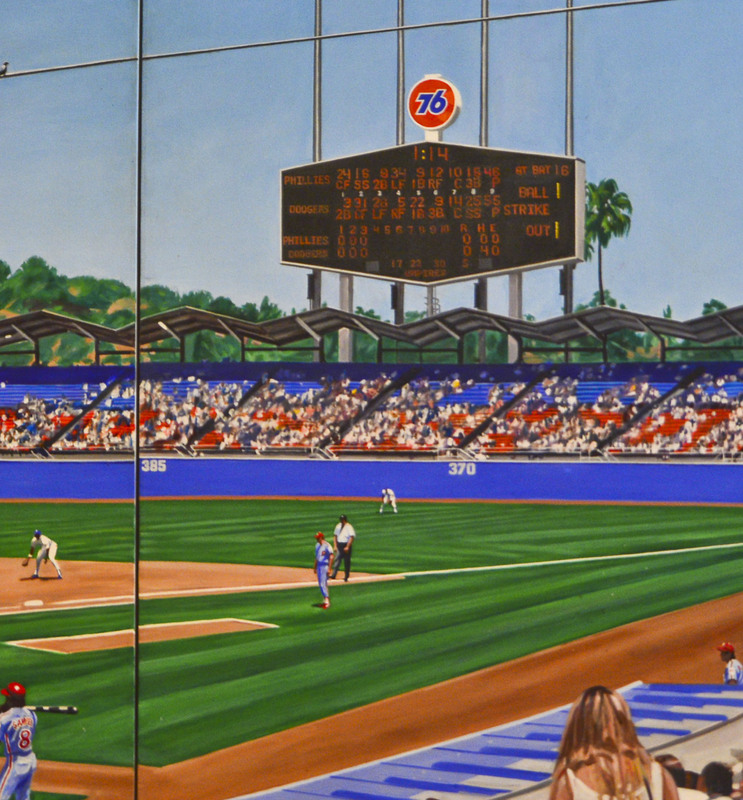 Maybe the largest sports painting ever created - this 64 x 222" three panel triptych oil on canvas - depicts an actual ballgame between the Dodgers and the Philadelphia Phillies on May 30, 1987 at Chavez Ravine Stadium. 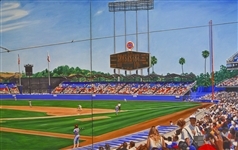 Your view is from the lower deck, just to the right of home plate, sweeping from the third base dugout past the palm trees and hills in the distance to beyond the right field flag pole. Orel Hershiser is pitching to the Phil's Luis Aguayo with Juan Samuel on deck. 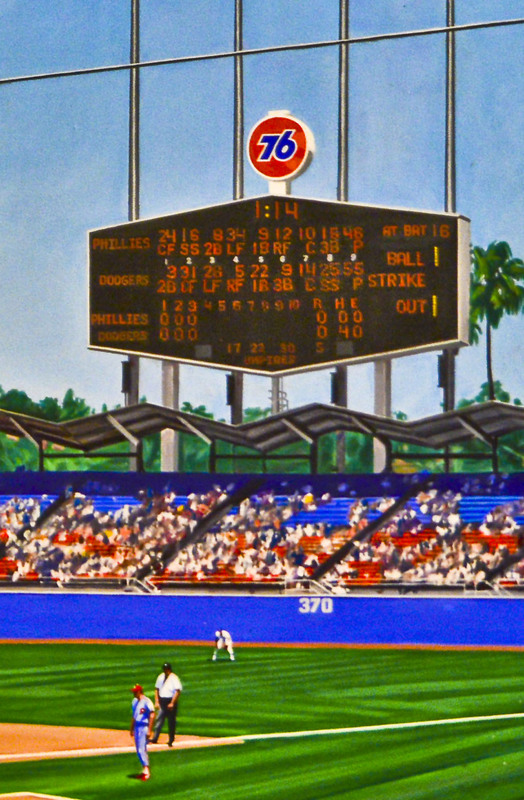 In the field for the Dodgers are Mike Sciosia, Franklin Stubbs, Steve Sax, Mariano Duncan, Mickey Hatcher, Pedro Guerrero, John Shelby, and Mike Marshall. Both lineups are clearly visible on the right field scoreboard. 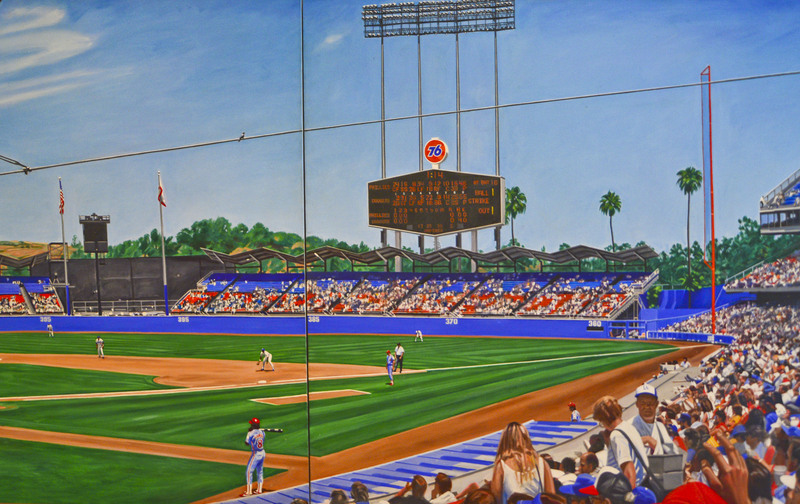 The painter, Andy Jurinko, a lifelong baseball fan, who died of pancreatic cancer on Feb. 14, 2011, was a noted sports artist. 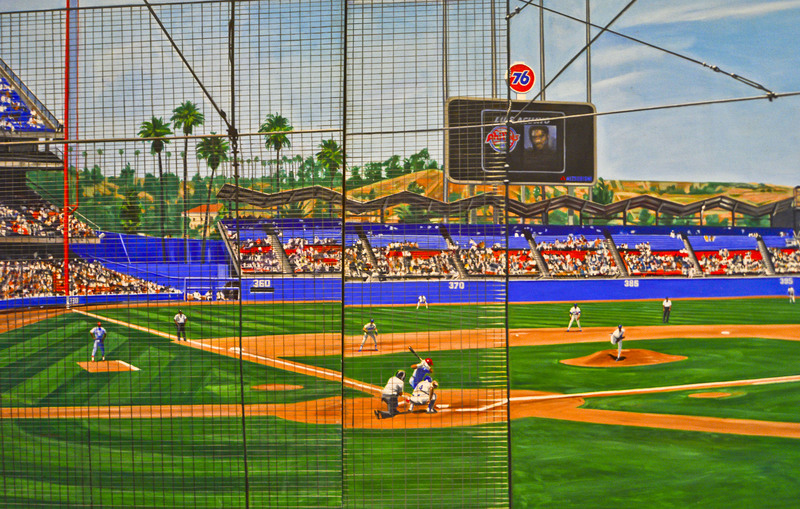 His paintings are in great demand by fine art collectors, have been showcased in galleries and museums across the country, including the Baseball Hall of fame in Cooperstown, Ohio, on the covers of more than 20 books, and have been featured in such publications as Sports Illustrated, The New York Magazine, Barron's and the New York Times. He painted more than 400 portraits of star players and more than 150 action pieces. His first book, “Heart of the Game” (2004), focuses on stars in both the National and American Leagues from 1946 to 1960. Another book, “Golden Boys,” (2012) includes more than 600 portraits of the colorful characters and stadiums that typify the Golden Era of Baseball and took him 20 years to create. It was only by the wisp of good fortune that the books were published. Their core material, 650 photographic slides of his paintings, were nearly destroyed on Sept. 11, 2001 when the World Trade Center came down. The south tower overlooked his loft and although parts of the planes that struck the towers were found in the badly damaged loft, the slides were protected by a file cabinet. 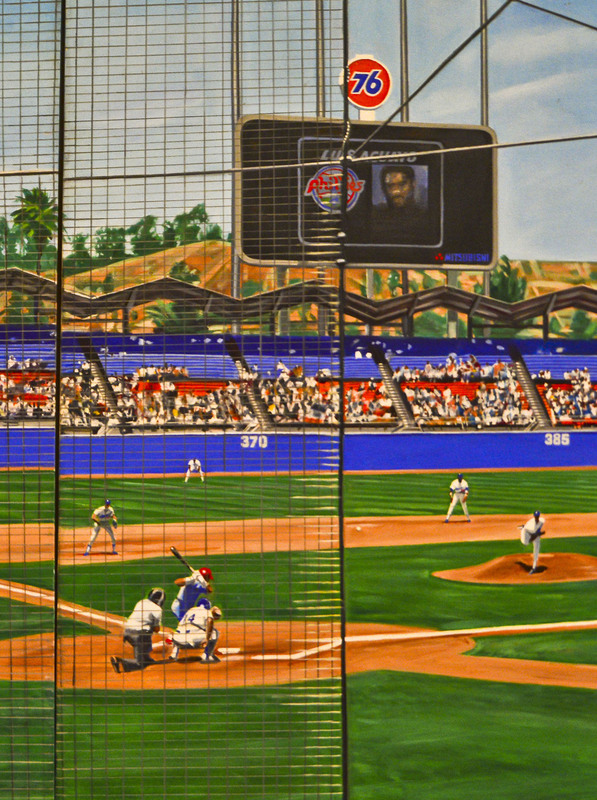 A lifelong baseball fan, Jurinko lived and painted in New York from 1976 until his death in 2011. Auction closed on Sunday, August 9, 2015.